The final chapter in a YA fantasy trilogy about a boy who learns that he’s the prince of a magical, parallel world. 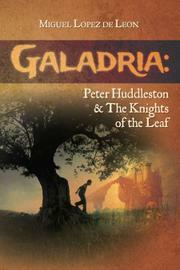 When readers left the titular hero in Peter Huddleston & the Mists of the Three Lakes (2014), he and his aunt, Queen Gillian Willowbrook, were ambushed during a parade celebrating his arrival in Galadria. The vile Knor Shadowray, his troops, and an army of flying harpies planned to slaughter the House of Willowbrook and take the Golden Realm by force. Peter escapes with the help of members of the House of Crimson and hides in an underground chamber. He’s shocked to find his mother, Patricia, there; he’d been told that she’d died in a car accident. After she explains her tragic back story, she leads him through Galadria’s labyrinthine sewers to the Great Palace, where Queen Gillian and her entourage are under siege by Shadowray forces. There, the queen decides to send Peter and her father, Henry, to recruit the Knights of the Leaf to aid them. The ancient order guards the primordial Forests of Fernell, where even the most inviting sights and smells can be deadly. If Peter and Henry survive the forest and find the knights, will the group be willing to help? For this finale, author de Leon sends his imagination into overdrive, delivering gorgeously elaborate characters and locations to readers who’ve been waiting to see what lurks in Galadria. Alongside the Knights of the Leaf, for example, are the Twigglia, pixies capable of deadly hypnotism; the Priestesses of Sertania, who abide with snakes; and wraiths that live in the corpse of a frozen dragon. Describing the latter, de Leon writes, “Each of the entities looked like a massless veil of deep shadow, but with a center full of silently erupting electricity.” The author strives a bit too hard for epic drama at times, bowing to a sci-fi/fantasy trope that darkens what is mostly a colorful trilogy. The final battle against the Shadowrays, although brutally violent, is genuinely cathartic. A grand finish to a YA trilogy that never fails to challenge audience expectations.